1. First, install LabVIEW™ Run-Time Engine 2009 - Windows 2000/7/7 x64/Vista/Vista x64/XP - (32-bit Standard RTE) – Installation file “LVRTE90std.exe” [160 MB] provided to registered users free of charge by NI (www.ni.com). Alternatively, it can be downloaded from http://www.spikesorting.com (Download page). 2. Next, install DAQmx device drivers supplied together with your NI DAQ device (check at www.ni.com for details). 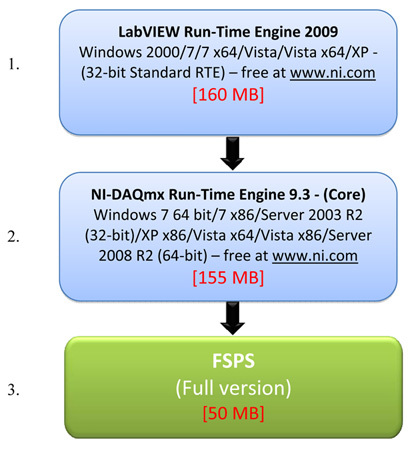 If you don’t have NI DAQ drivers installed, even if you intend to use FSPSTM software exclusively for off-line analysis (without acquisition board), you should nevertheless proceed with installation of NI-DAQmx Run-Time Engine 9.3 - (Core). Installation file “NIDAQ930f2Core.zip” [155 MB] is provided to registered users free of charge by NI (www.ni.com). Alternatively, it can be downloaded from http://www.spikesorting.com (Download page ). 3. Install FSPSTM program: http://www.spikesorting.com [approx. 50 MB]. (Download page). Use Uninstall FSPSTM (file "unins000.exe"), located in the FSPS application folder, to remove the software from computer. To uninstall LabVIEW™ Run-Time Engine 2009 and NI Device Drivers you should use the standard tool on the Windows Control Panel.